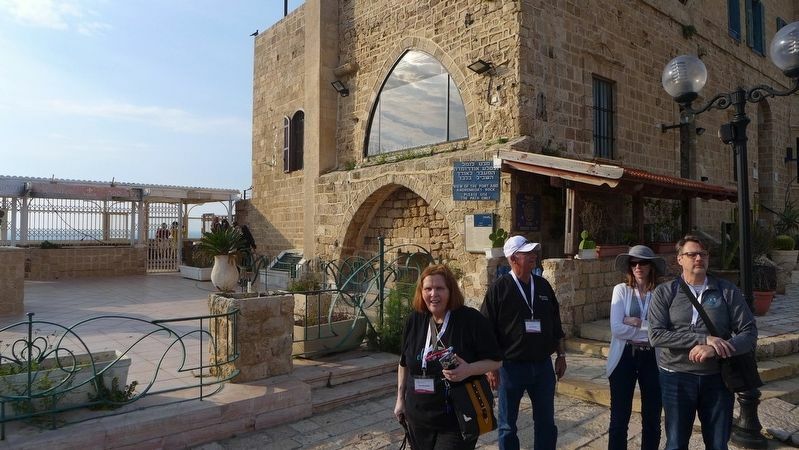 The Jaffa port is one of the oldest ports in the world, in almost continuous operation for the past 4,000 years. The port takes advantage of calcareous sandstone (kurkar) reefs that create a natural breakwater and safe haven. Beginning in the mid-19th century the port was expanded and upgraded, but it still could not accommodate large steamships. These anchored at sea, with cargo and passengers ferried to land in small boats. The British Mandate saw construction of a concrete pier and breakwater along with large warehouses and cranes. During the 20th century the port gradually began to sink, after 1965 it was no longer used for cargo. Location. 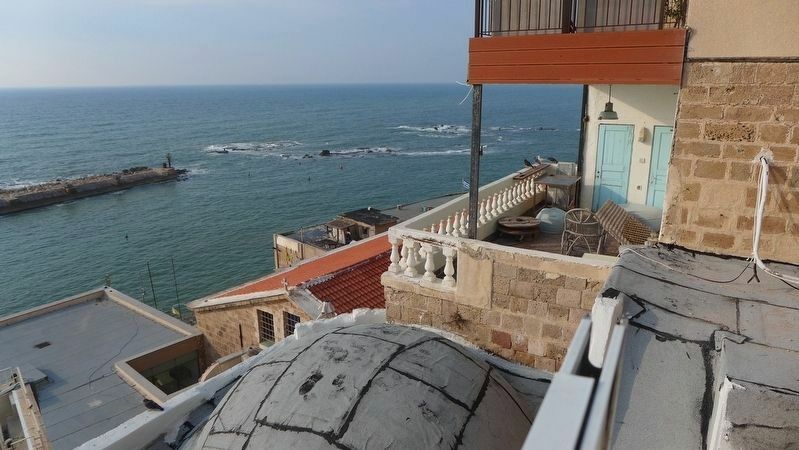 32° 3.251′ N, 34° 45.081′ E. Marker is in Tel Aviv-Yafo, Tel Aviv District, in Jaffa. Marker is on Kikar Kdumim just north of Shim'on Ha'bursekai Street, on the left when traveling north. Touch for map. 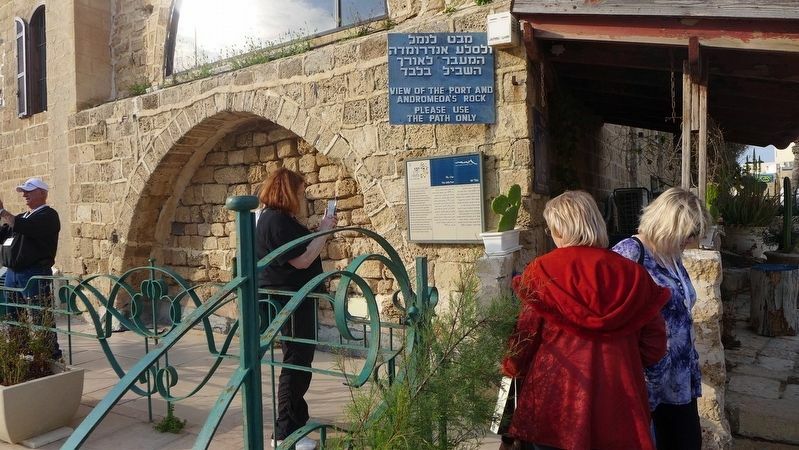 Marker is at or near this postal address: Kikar Kdumim 10, Tel Aviv-Yafo, Tel Aviv District, Israel. Touch for directions. View of the marker on the side of the building that I believe houses the Ice Old Jaffa eatery. (about 120 meters away); The Whale Sculpture (about 150 meters away); The Egyptian Governor's Residence (approx. 17.8 kilometers away in Central District); Tel Afeq - Antipatris (approx. 17.8 kilometers away in Central District); The Roman Cardo (approx. 17.8 kilometers away in Central District). A distant view of the marker on the side of the building that I believe houses the Ice Old Jaffa eatery. 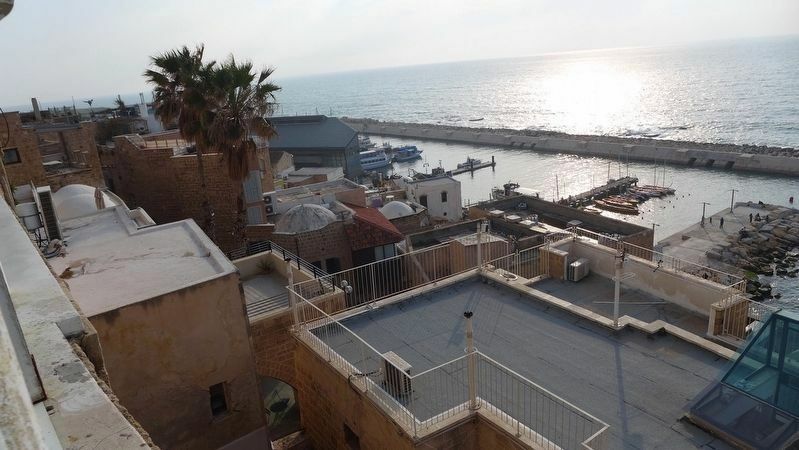 The actual view of the old port of Jaffa is seen from the balcony that runs along the backside of the adjacent patio. 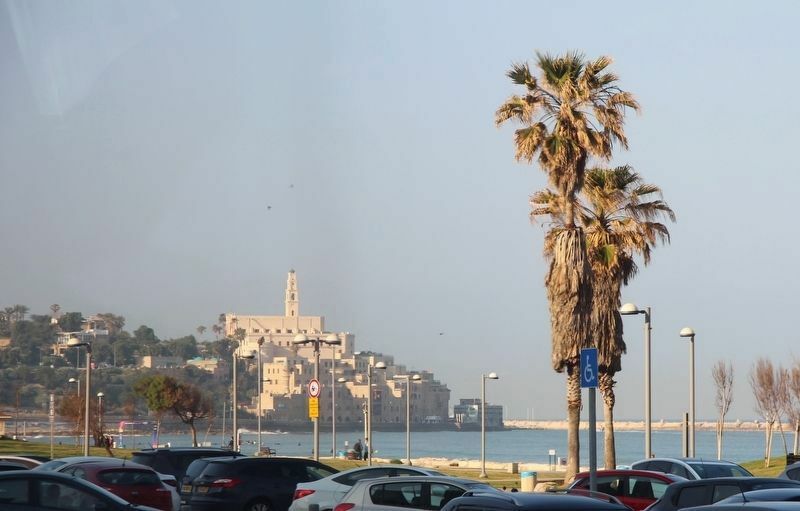 View of the present day port of Jaffa. View of the ruins of the ancient port Jaffa, seen just beyond the breakwater, in the midst of the white water and rocks. More. 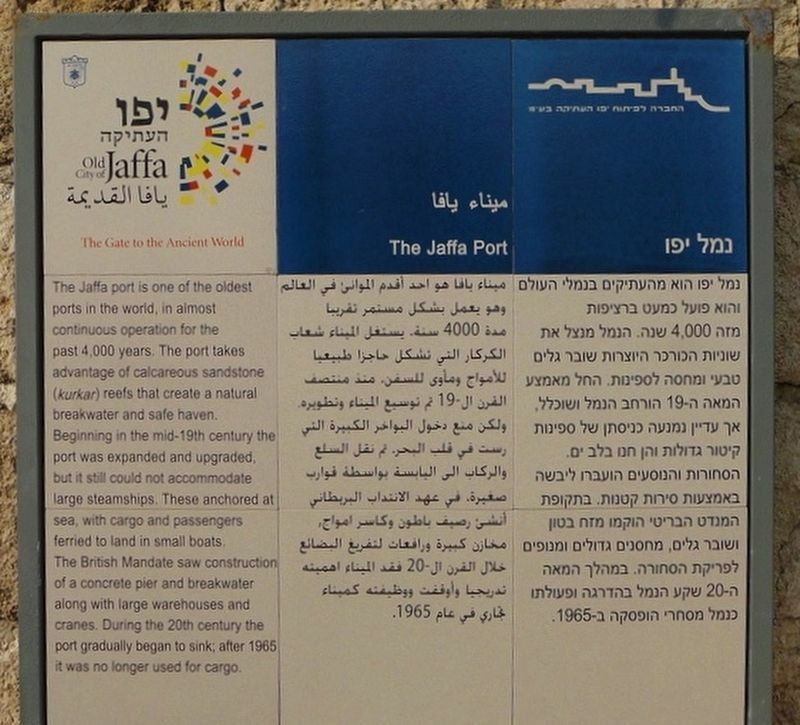 Search the internet for The Jaffa Port. Credits. This page was last revised on April 19, 2019. This page originally submitted on April 17, 2019, by Dale K. Benington of Toledo, Ohio. This page has been viewed 37 times since then. Photos: 1, 2, 3, 4, 5, 6. submitted on April 17, 2019, by Dale K. Benington of Toledo, Ohio.